Vaadin is a Rapid Application Development (RAD) framework for RIA applications. I only know it for a few months but since I started experimenting with it, I’m really in favor of it. I see a lot of advantages compared to Sun’s Java EE standard front-end framework JSF. First of all Vaadin is a java library, so you only have to write Java to build a complete frontend. No need for a specific frontend language, no need for converters (for comboboxes),… This also implies that you can use the full Java power on the frontend side and that’s an huge advantage because frontend code is now type-safe and easily refactorable. You can unit test your frontend with JUnit. You can also use all existing java libraries on the frontend side, for example LOG4J. Another advantage is the fact that Vaadin is easy to learn (JSF isn’t!) and to use: it’s straigtforward. It feels like developing desktop apps and for me developing desktop apps feels much more intuitive than developing web-apps the way I’m used to. Vaadin uses convention over configuration. No need to register new components, validators or whatever in different xml files. Themes have a default folder and a default folder structure. But enough about Vaadin itself. The purpose of this blog post is not to explain Vaadin itself in detail but how to integrate it with other commonly used frameworks: Maven and Spring. Vaadin comes with a plugin for Netbeans and Eclipse. These plugins provide a wizard which makes the creation of a new Vaadin project, themes and components (also client side) very easy, it even provides a WYSIWYG editor but that’s still experimental. There are also archetypes ‘vaadin-archetype-sample‘ and ‘vaadin-archetype-widget‘. The first one generates a sample Vaadin app and the second one creates a project to illustrate how to create custom GWT widgets (yup Vaadin is based on GWT). Of course the Vaadin library itself can be found in several Maven repo’s. The only shortcoming at the moment is that the add-ons aren’t ‘Mavenized’ yet. You’ll have to download the jar’s manually. But an issue is created fror that and they’re working on it, so it will be there soon. 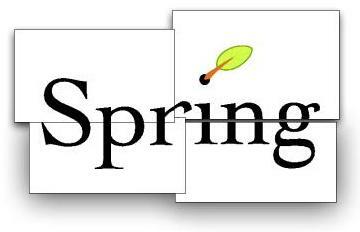 To enable Spring in a Vaadin app you’ll have to use SpringApplicationServlet as explained here. That’s all. Since frontend and controller are now written in java, we can inject Spring managed beans into the Vaadin controller classes. Of course we would like to use annotations instead of all those XML config so we would like to make use of the @autowired annotation for example. To do that we must put the <context:spring-configured /> element in our applicationcontext and enable component scanning by means of the <context:component-scan /> element to scan out controller classes. The controller classes can be Spring managed by adding the @Component annotation but it sounds acceptable that you don’t want to make some front-end stuff Spring managed. If you don’t want to do that you can use the @Configurable annotation. It marks a class as eligible for Spring-driven configuration. Now the last thing that needs to be done is AspectJ weaving, otherwise using the injected Services will cause NullPointerExceptions. You could add the maven-aspectj-plugin to enable compile time weaving. The disadvantage of this approach is that you have to do a Maven compile because compiling in the IDE won’t trigger AspectJ weaving. You could change the project into a Maven project instead in Eclipse but then everytime you save your file, Maven compilation will be executed and that’s not what we want. We can use <context:load-time-weaver /> to enable AspectJ load time weaving. This way we don’t have to run a Maven compile to weave. You’ll have to pass spring-agent.jar to the application when running it to make loadtime weaving work. Once this is done, it’s pure AspectJ LTW which can be configured using ‘META-INF/aop.xml’ which is automatically loaded as AspectJ LTW is initialized by <context:load-time-weaver/>. The last step is to pass ‘-javaagent:path/to/aspectjweaver.jar’ to Tomcat’s VM arguments instead of using the aop.xml and load-time-weaver tag. If you don’t like load time weaving (it makes hot redeployment fail from time to time), you can remove the <context:load-time-weaver> element and the aop.xml file. Instead you can install AJDT plugin for Eclipse. The project will be recognized as an AspectJ project and yhe only thing you need to do is adding spring-agent.jar to the project’s Inpath. More Vaadin stuff in one of the next blog posts! Is it true that Vaadin + Spring in Liferay is hell? Vaadin + Spring works like a charm. You can find enough tutorials (also on the Vaadin website) about how this can be achieved.